I’m forgetting things. I can’t keep things in order – even with lists. I walk into a room and don’t remember what I went in for…I’m too young for this! One thing’s for sure – I’ll never forget this “recipe” – or probably even have to refer back to it. It’s that easy. Perfect for summer. 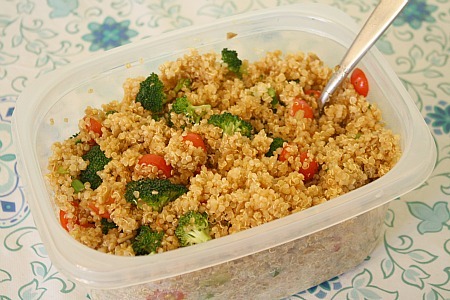 Mix quinoa, seeds and veggies together. Combine remaining ingredients in a small bowl and mix, then add to quinoa mixture. Stir to combine, and season to taste. Serve at room temp or refrigerate. This entry was posted in QuickAndEasy, quinoa, salad, side dishes. Bookmark the permalink. I am loving this recipe. Adding the sunflower seeds is a great idea! Bookmarked.